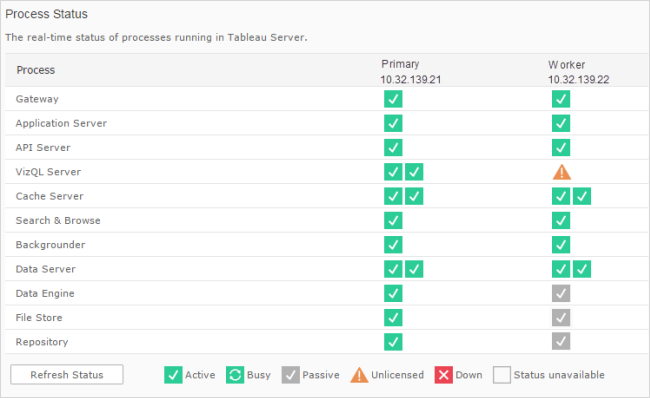 There are several status indicators on the Tableau Server Status page that help you understand the state of Tableau Server processes. An orange-color status box, "Unlicensed", indicates that one of the VizQL server processes is unable to retrieve the Tableau Server license information. There may be several reasons why the process is unable to access this information. For example, there may be network issues preventing a VizQL process, which is running on an additional node, from communicating with the initial node machine. Or, the process may be getting sent more requests than it can accept at that time and can’t handle the licensing request. As a result, some of your users may be able to access views while others cannot. To resolve the problem, stop, then start Tableau Server.